The truth is that the story does not really begin in 2015. Since 2011 the institutional fishing sector has been quickly dismantled, probably with the support and applause of many that do not want to see sustainable fishery policies being properly implemented. Specifically, 2011 marks the end of national fisheries statistics and the beginning of an era of political instability. In 2015 we watched, still rather hopefully, the end of a dysfunctional Ministry of Fisheries, and the incorporation of the fishing sector into MAPA, as the Aquaculture and Fisheries Secretariat. The transition was turbulent, and right when parts of the sector, namely the industrial one, had begun to adapt, we are surprised by another change, driven by political party interests. In March 2017, the Aquaculture and Fisheries Secretariat was once again transferred to another ministry, this time to the Ministry of Industry, Foreign Trade and Services. Yes, the names of ministries are as schizophrenic as their goals. 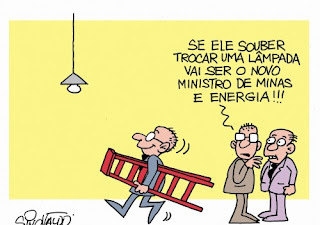 Charge depicting the "requirements" to be a Ministry in Brazil ("if he knows how to change a light bulb, he will be the new minister of Mines and Energy"). By Sinovaldo. It seems that Dr. Ruffino’s fears of not having small-scale fisheries properly represented might just come to pass under a ministry that carries “industry” in its name. Such incorporation of all fisheries into the Ministry of Industry, Foreign Trade and Services seeks to encourage investments of national and international business, as an attempt to industrialize the national fishery further. Under such policy, small-scale fisheries are not that relevant after all, they just provide barely more than half of the fish we eat and employ most of the fishers in the country. Sarcastic comments apart, the country is not prepared to boost industrial fisheries and aquaculture, without basic knowledge on our stocks and on our environment. Perhaps it is time to acknowledge and fix the mistakes done in 2011 with the suspension of fishery statistics before venturing into uncharted waters. Besides, I do want to draw attention to the marginalization of the whole small-scale fishery sector, which seems to become more and more invisible under stronger and stronger neoliberalism. The new policies tend to follow the revitalized heading of the country: wealth centralization at the costs of ignoring millions of families that depend on these resources. One thing is certain: the fishing industry is being forced once again to adapt to a new way of working, hoping to pave its way through the corridors of a new political institution. 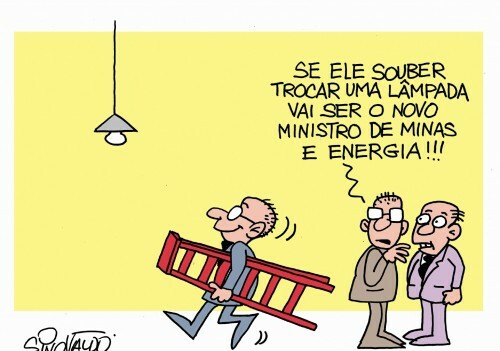 The small-scale sector, on the other hand, without any power to lobby, sinks in dark waters, while few politicians that completely ignore the reality of Brazilian fisheries, celebrate their new positions.